According to Zenith, this summer’s World Cup campaigns will add $2.4bn to the global ad spend this year. In the UK, it will account for an extra £40m, considering both the extra money spent by advertisers seeking to reach World Cup audiences and the reductions by advertisers looking to steer clear of this crowded period. So, of the dozens of companies linking their summer campaign to the beautiful game, who has scored a cracker and who deserves to be red-carded? Two years ago, the island nation of Iceland qualified for a major football tournament for the first time. They then exceeded all expectations at Euro 2016, beating England on their way to the quarter-finals. Before 2014, the country had only won 16 World Cup qualification matches. Now, the Icelandic squad are heading to Russia for their first World Cup and with a population of under 350,000 it’s no surprise the nation is getting behind its team. Icelandair have gone back to the start of their country’s international football history for a new ad celebrating the squad’s recent achievements. Having been a supporter of the team for 70 years, the airline has produced an emotional and powerful ad ‘For Iceland’ which brings the country’s football story up to date. A combination of England footballers and children in a marketing campaign could be a recipe for disaster. These things often don’t end well, but there’s plenty of humour in Lidl’s new World Cup campaigns. Leveraging an existing football relationship gives authenticity to the campaign, and through the supermarket’s partnership with the national FAs they have created 3 million opportunities for 5-11 year-olds to participate in grassroots football programmes across the UK. The brand use these 5-11 year-olds in their campaign, and it’s these kids that are the stars of the show. 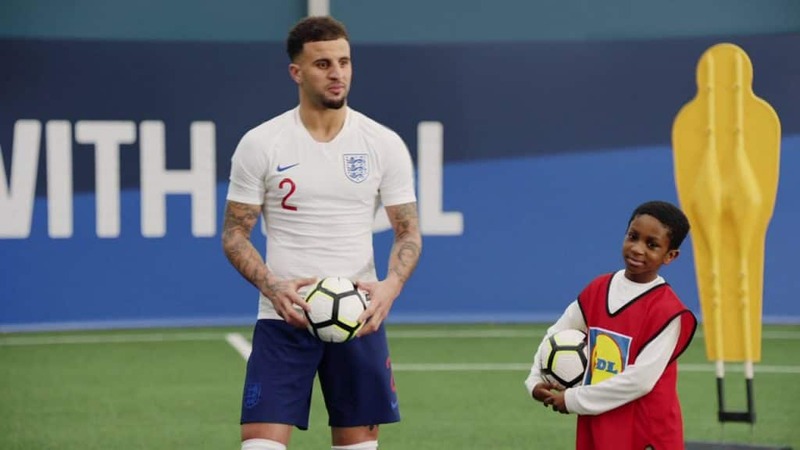 From a discussion about the speed of a girl’s pet dog to Kyle Walker being told the true meaning of pressure, this is a sweet and engaging ad that references the World Cup while also selling Lidl’s grassroots football credentials. Nicely done. Four years ago, Unibet’s ‘Luck is no coincidence’ campaign proved that creating entertaining and interesting content could be a great way to drive engagement. This time, it’s global electrics brand LG who have come up with an interesting content-based idea. Their ‘Live the Game’ campaign sees players from England’s past (Terry Butcher), present (Eric Dier) and future (Dominic Calvert-Lewin) watch important England matches on a large LG TV. The trio watch and discuss these matches on their OLED TV and talk about playing for the national side and their careers. It’s an interesting and insightful approach, and you can watch the three videos on LG’s website. There are precious few footballers who have gone on to enjoy a long and successful acting career. Frank Leboeuf may be the only man to have won a World Cup and star in an Oscar-winning film (he played a doctor in The Theory of Everything) but other than a few Eric Cantona movies it’s hard to think of any football star who’s gone on to big box office success. We can blame Guy Richie for a couple of the less heralded transitions, and the less we say about David Beckham’s turn in the terrible King Arthur: Legend of the Sword and Vinnie Jones’ entire thespian career, the better. So, when a brand decides to get players to actually act the outcome is often awful, as you can see in this cringeworthy effort from Pepsi. Overproduced and glitzy, this is a downright cheesefest. It’s hard to say which is the worst bit, although for us Dele Alli’s pretend embarrassment at nearly covering a woman in blue paint takes some beating. The Pepsi advert is a case study in amazing marketing, however, when compared to the recently launched (and ditched) Mastercard World Cup campaigns. This month, the credit card brand announced that for every goal scored in this summer’s World Cup, and every goal that Lionel Messi and Neymar score over the next two years, it will provide 10,000 meals to hungry children. On the face of it, linking the brand’s tie-up with the World Food Programme could have been a way of demonstrating their charitable credentials. However, it soon became clear that the campaign had scored something of an own goal. Henry Winter, chief football writer for The Times, said: “Compassion should never be a competition. It should be an instinct. And what does that say to Messi and Neymar? If you miss a goal, people starve.” imagine the guilt when a goalkeeper saves a penalty and 10,000 children don’t get a meal. After a significant backlash, Mastercard were forced to ditch the campaign. 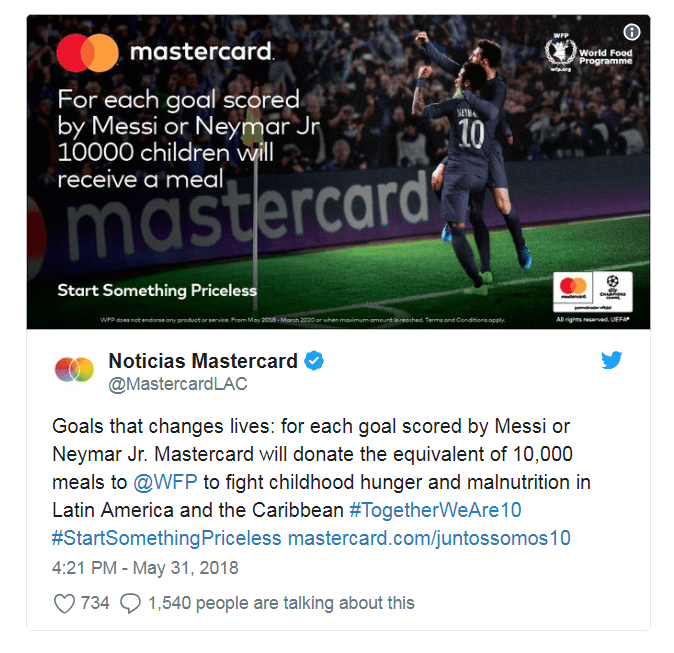 A statement said: “Mastercard has heard the comments about our campaign in Latin America featuring our brand ambassadors Messi and Neymar Jr. in support of the United Nations World Food Programme. So which brands have impressed you with their World Cup campaigns this summer? Let us know!